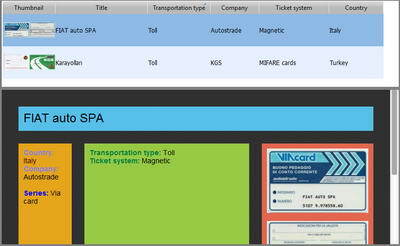 A transportation ticket is a ticket issued by a operator that enables the bearer to travel on the operator's or partner's network. Transportation tickets can authorize the bearer to travel a set itinerary at a specific time, a set itinerary at any time, a set itinerary at multiple times, or an arbitrary itinerary at specific times. Tickets are used in a range of transport types, from busses to cruise ships. The transportation tickets also made from various materials, some are also electronic and employ different systems of identification or payment. This can be paper, cardboard, bar code, chip and scratch tickets, plastic and magnetic tickets. 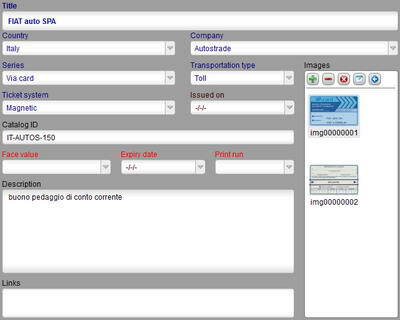 If you are one who would like to start your own collection, you are going to use this transportation tickets collection software.